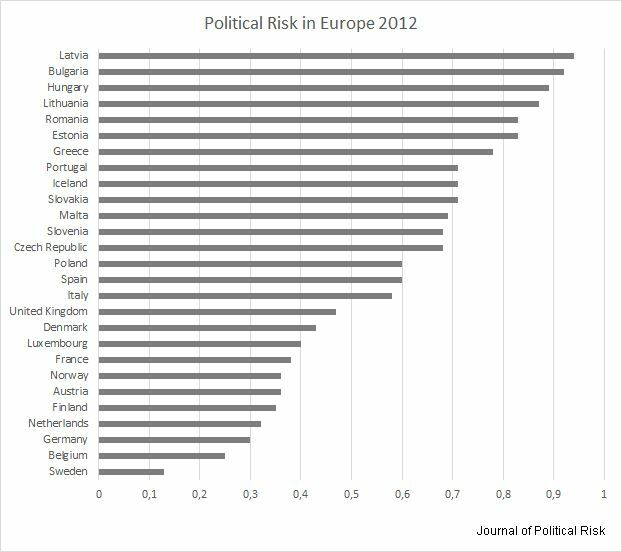 Germany | Corr Analytics Inc.
Journal of Political Risk, Vol. 1, No. 5, September 2013. 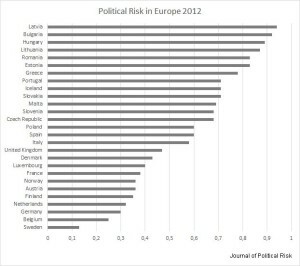 Figure 1: Political Risk in Europe 2012. The index arranges the countries relative to one another. The separate values would change if more cases are added to the sample. By Stoycho P. Stoychev, Ph.D. This entry was posted in Austria, Belgium, Bulgaria, Consumer spending, Corruption, Czech Republic, Datasets, Denmark, Estonia, Europe, Finland, France, Germany, Greece, Hungary, Iceland, Inflation, Italy, Latvia, Lithuania, Luxembourg, Malta, Netherlands, Norway, Poland, Portugal, Quantitative, Romania, Slovakia, Slovenia, Spain, Surveys, Sweden, Uncategorized, United Kingdom on September 12, 2013 by admin. 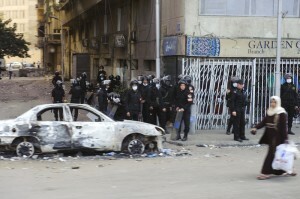 Egyptian riot police in Cairo, January 28, 2013. Photo credit: Jackq, Dreamstime.com. A muslim mob attacked the seat of Egypt’s Coptic Orthodox Church on Sunday, resulting in Christian-Muslim riots and an anti-government outburst by the Coptic Pope yesterday (WSJ). This entry was posted in Egypt, France, Germany, Italy, Middle East, United States on April 10, 2013 by admin. Today, France joined the UK in publicly threatening to rupture a common approach to European Union (EU) foreign policy by sending arms to Syrian rebels (Bloomberg). This, on the heels of the January 11 unilateral French intervention in Northern Mali. Since the May 2012 election of French President François Hollande, France has increased its political independence with respect to the EU. This distresses Germany, which wants closer political union. Without seeing gains in political unity, Germany could decrease its financial support to the European project (Council on Foreign Relations). This augurs poorly for European monetary union, the value of the Euro, and global economic stability. Lack of German financial support to Europe would increase the probability that Portugal, Italy, Ireland, Greece, or Spain would be forced out of the Euro. Were this to happen without prior agreement from the rest of the eurozone, the cost to the dropout would be catastrophic in terms of trust and with it, access to money markets. The cost to the remaining eurozone countries would be an increase in eurozone per capita money supply and resulting inflation of the Euro. Confidence in the Euro would fall, and the chance of further dropouts would be reflected in the foreign exchange market. Decreasing confidence and loss of value increases incentives for other EU countries to be the next to leave the Euro, with spiraling downward effects on its value. The massive investment in the Euro — and the amount that could be lost given failure — explains why Germany is willing to prop up the currency through stabilization of economically ailing eurozone members. Ailing eurozone countries milk their wealthier neighbors with the threat of Euro collapse. Euro collapse is not just a European problem. It would have a disastrous effect on the global economy, including major European trading partners such as the United States and China. Thus, all trading partners with Europe have — at least for economic reasons — a stake in the success of a European common foreign policy. This should be considered when jockeying for short-term diplomatic goals such as arming the opposition in Syria. Increasing European political integration and unity should give the investor increased confidence in the Euro; decreased integration and unity will have downward effects. In part because of understandable historical differences based on the subjective experience of World War II, Germany is profoundly leery of military intervention. France and Britain frequently see intervention as an obligation to stop massacre, genocide, and civil war, especially when such intervention involves ancillary benefits such as removing a rogue or terrorist threat. Increased institutional power to overcome foreign policy differences in Europe would assist common foreign policymaking, and thereby improve market confidence in the Euro. Public pronouncements of Britain and France asserting foreign policy independence from the EU are geared towards influencing Germany and other recalcitrant EU states to take the UK-France-Italy approach on Syria. They show that for the moment at least, short-term foreign policy goals are trumping aspirations of a common EU foreign policy, stability of the Euro, and mitigation of risk to the international economy. Watch for any hedge by the German government against the Euro, which will precede rapid loss of confidence in the Euro and a decrease in German monetary support to the currency union. This entry was posted in China, Europe, Foreign Exchange Market, France, Germany, Global, Italy, Qualitative, Uncategorized, United Kingdom, United States on March 14, 2013 by admin.